Right now, thousands of surfers are suffering with hearing challenges due to years of passionate all-season wave riding. On Friday, the day after our latest snowstorm, 10 surfers were swimming in Deal. Even more were spotted on the Asbury Park coastline. Some of these diehards have been ignoring their hearing issues because of, until recently, the lack of intensive ear care in New Jersey. 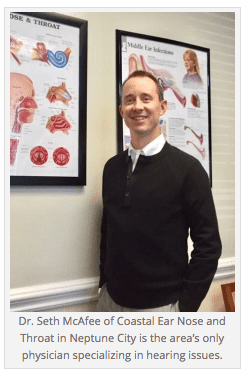 Dr. Seth McAfee of Coastal Ear Nose and Throat in Neptune City is the area’s only physician specializing in hearing issues. Enter Dr. Seth McAfee, otolaryngologist with a specialization in neurotology at Coastal Ear Nose and Throat in Neptune City. Translation: he’s one of literally a handful of ear, nose and throat physicians in the country with the highest degree of training focusing on ear health problems many of which are connected to the brain. Less than 15 physicians in the US graduate with his level of expertise each year. Hearing challenges for surfers usually hit a critical note when they are thirtysomething, however, Dr. McAfee has treated many in their mid-20’s. To perfect an ahead-of-the-curve, minimally invasive procedure that addresses ear bone blockage, Dr. McAfee spent time with a renowned California-based surgeon. Coastal ENT is the only to offer the treatment on the east coast. He is also the only greater area physician who performs Cochlear implant surgery. In 2016, Dr. McAfee gave a woman the gift of hearing by performing the first implant surgery at Jersey Shore University Hospital. “…long-term bouts of water and wind exposure generates change in how the bone of the ear canal (auditory canal in image) grows and protects itself,” said Dr. McAfee who leverages his deep knowledge and technology to restore health and hearing. He’s thoughtful in a contemporary style. His answers are paced, not reflexive. Dr. McAfee is accessibly contemplative whether he’s talking about a favorite pastime (hiking with his beautiful wife Erin and their Bernedoodle Ruby), the music he’s playing on his iPhone (Red Hot Chili Peppers and Ray Lamontagne) or even what some patients call his “magical powers” (restoring a 65 year-old patient’s hearing to a level where she could drive again). Dr. McAfee lives and breathes what many of us take for granted – our hearing. People who were once just functional hearing-wise due to a variety of reasons are now optimal thanks to the specialized care he’s made available here. Many of his patients ignored their hearing challenges because they didn’t want to manage the logistics associated with medical treatments in New York City, Philadelphia or San Francisco. His commitment to serving others has always been part of his DNA, inspired by his parents at an early age. In grade school his interest in science and nature began to flourish, all ultimately morphing into a career in medicine.